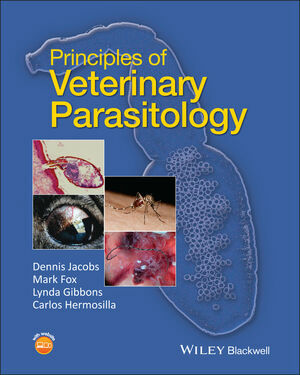 Principles of Veterinary Parasitology is a student-friendly introduction to veterinary parasitology. Written primarily to meet the immediate needs of veterinary students, this textbook outlines the essential parasitological knowledge needed to underpin clinical practice. Conceptual relationships between parasitic organisms, their biology and the diseases they cause are clearly illustrated. Help boxes and practical tips are included throughout alongside a wealth of colour photographs, drawings and life-cycle diagrams. Organised taxonomically with additional host-orientated chapters and focussing on parasites that commonly cause animal or zoonotic disease, welfare problems or economic losses, students worldwide will benefit from this straightforward and easy to comprehend introduction to veterinary parasitology. After graduating from the Glasgow Veterinary School and a short period in the pharmaceutical industry, he devoted his professional career to teaching and research. He has served as Vice-President of the World Association for the Advancement of Veterinary Parasitology and Secretary of the European Veterinary Parasitology College. He has over thirty years’ experience of teaching and research in the veterinary parasitology field, having graduated from The Royal Veterinary College and spent a period in small animal practice. His current research interests focus on the epidemiology of parasite infections in both domestic and wild animals. He was awarded the William Hunting medal in recognition of avian coccidiosis research. Having studied at Leicester University and the London School of Hygiene and Tropical Medicine, she became Head of Animal Helminthology Biosystematics at the CABI Institute of Parasitology. She is a recipient of the Elsdon-Dew medal (Parasitological Society of Southern Africa) and the Betts Prize (The Royal Veterinary College). Having gained a veterinary degree from the University Austral of Chile, and doctorates from Justus-Liebig-Universität in Germany, he worked as Senior Lecturer in Veterinary Parasitology at The Royal Veterinary College, London, before returning to the Institute of Parasitology in Gießen as Professor to continue his enthusiasm for teaching and research. He is also visiting professor at the University Austral of Chile.